What do a restaurant, a college, a hospital, a wastewater treatment plant, and a prison have in common? They all have the potential to increase sustainability. Before starting my Community Fellowship at the Sustainable Living Center (SLC), I had a limited view of who could adopt sustainable practices. In classroom discussions, sustainable possibilities usually stay centered on the actions of industry, government, and individuals. However, through my work on the $mart Business Partners Program with the SLC, I have come to see that not only can any business reduce energy, waste, water, toxics, and materials, but businesses typically have greater incentive to take cost-saving measures, which sustainable actions provide. In the past few months, I have been shadowing my adviser to witness how she conducts interviews with different business partners. We have met with businesses who are already enrolled in the $mart Business Partners program, and thus only need to renew their status by reviewing past goals and creating new goals for 2017. It has been an eye-opening experience into environmental consulting work, since my adviser and I need to have expertise about the best available technology and practices to help businesses figure out what to change. Before my fellowship, I had no idea about the efficiency of tubular lights (Fluorescent T5s are better than T8s or T12s and LED tubes are up and coming), the toxic off-gasses from vinyl flooring, and the GreenSeal certified cleaning products. Although small changes that businesses make are miniscule relative to the large societal changes that need to happen to combat climate change and environmental degradation, I am glad that the $mart Business Partners program is taking steps to make sustainable practices part of the status quo. 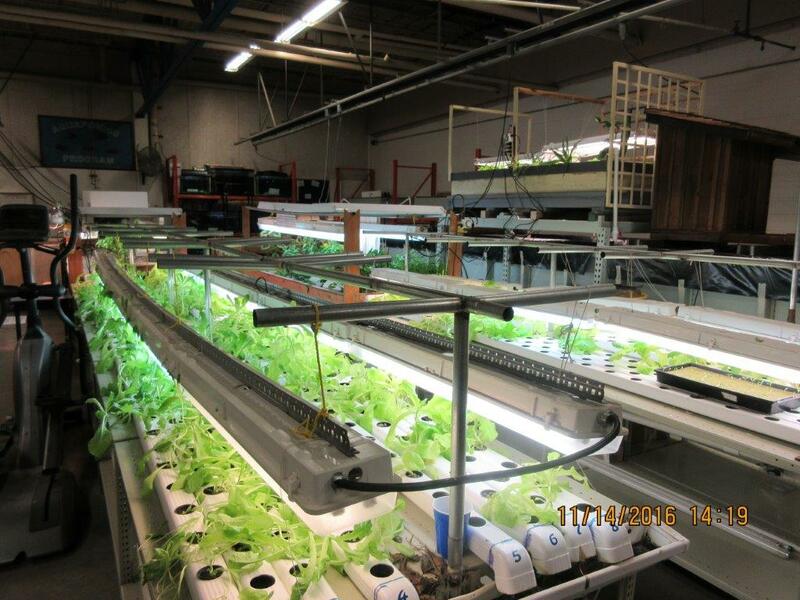 The aquaponics vegetable garden operation at the State Penitentiary’s Sustainable Practices Lab. It has been really cool to see that some businesses are self-driven in their sustainability projects, while others have trouble knowing where to start. One of the more unique meetings I’ve had was when I toured the State Penitentiary and got to see first-hand their Sustainable Practices Lab. The SPL is a singular program within the prison where certain inmates have projects re-upholstering furniture, gardening using aquaponics, producing compost using worms, re-claiming used wood, repairing bikes, and sewing quilts out of used fabrics. The SPL takes a lot of materials that would have gone to landfills and creates products that are either used in house or donated to charity. It has also been enlightening to see the challenges businesses face when switching to more sustainable practices. Many businesses face obstacles in securing funding for bigger improvements, such as solar panels, building remodels, or even a more efficient water heater. Others are limited by certain regulatory standards required by law or they’re limited by inter-organizational bureaucracy. Another limitation is practicality. Jacobi’s, an Italian café in town, tried to use corn-based takeout containers, but the containers did not hold hot and saucy pasta, so they had to revert to recycled cardboard containers. Without this fellowship, I would lack awareness of the sustainable projects and practices that local Walla Walla businesses undertake, and naïvely believe that sustainability works in all cases. Attaining insight into all the sustainable practices occurring behind the scenes is one of the best aspects of my fellowship work. 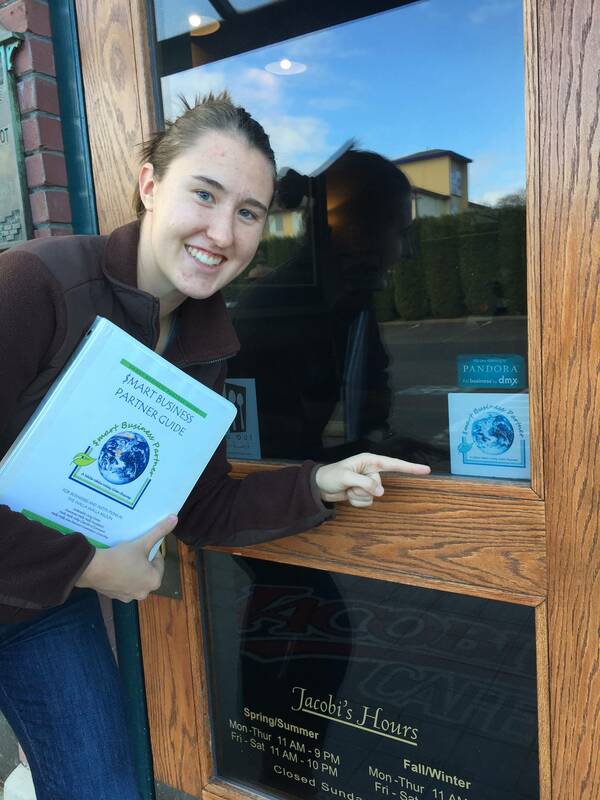 To find a $mart Business Partner, look for the decal on the business’ front door or check out the $mart Business Partner website http://www.sustainablelivingcenter.com/usdmart-business-partners. In September, the Chamber of Commerce recognizes a few of the $mart Business partners with a $mart Business Partner award. I am in charge of helping previous partners renew their partnerships and helping new businesses interested in becoming partners create goals for 2017. After the goals are completed, I use excel to track and help businesses calculate their reductions in energy, materials, toxics, waste, and water usage. 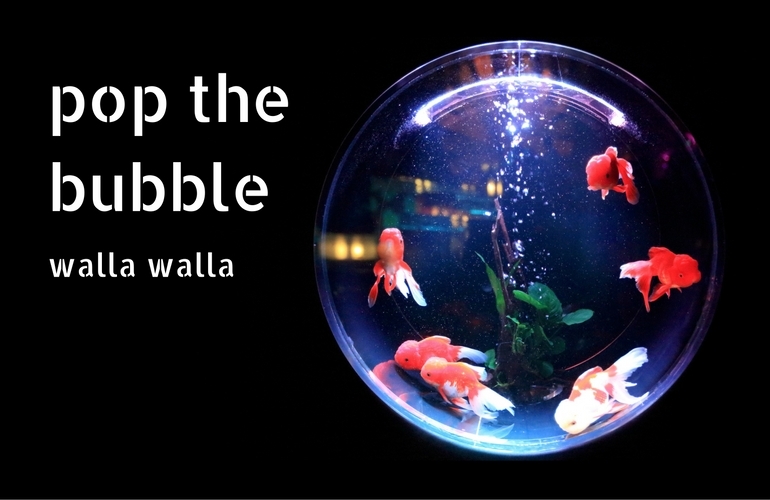 I am looking forward to continuing my work with the different businesses in Walla Walla and seeing the different approaches each takes towards sustainability. I can’t wait to reconnect with each business partner come spring to help them identify their cost reductions as well as their reduced environmental impact.